Our south Texas facility is proud to staff the most qualified and dedicated team in the Laredo area. Your hearing health-care is administered by state-licensed audiologists with years of clinical experience. We strive for the highest level of patient care, using both knowledge and compassion to pinpoint the best hearing loss solution for each individual patient. When it comes to your hearing, you need expert recommendations to ensure you’re getting the right type of care. Our audiologists have been educated, trained and licensed to provide each patient with the most comprehensive evaluation, diagnosis, and treatment. Hearing solutions begin with an understanding of how the ear works; a comprehensive and tailored hearing examination and then followed by a detailed explanation of the results and recommendations. We also coordinate with the patient’s medical doctor, so we can determine the best course of action for the diagnosis. From diagnosis to rehabilitation, our audiologists want to make sure you’re fully taken care of. We start with the appropriate testing for both adults and children and make the necessary recommendations when it comes to the right hearing aid to help alleviate some of the strain. 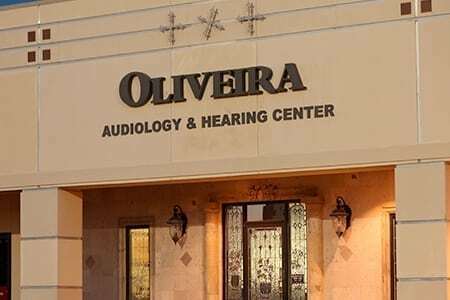 At Oliveira Audiology & Hearing Center, it’s easy to put your trust into our licensed professionals. Each earned a Doctor of Audiology (Au.D.) degree from an accredited institution, and our facility boasts over 25 years of combined experience. The doctors that lead our team entered into audiology with a passion to improve the quality of people’s lives. The ability to hear clearly and consistently is a key aspect of smooth communication, and we believe everyone should have an opportunity to discover the benefits of better hearing. Our team is invested in the improvement of all of our patients, pushing us to go above and beyond to find the solution with the greatest chance of success. Our business is family-run, and we extend that same familial hospitality to each of our patients. We’re committed to thorough and thoughtful health care. You’re in good hands at Oliveira Audiology & Hearing. Consulting a licensed audiologist is the best way to detect auditory problems and begin your journey to better hearing. To get started with your hearing health-care, review our resources or reach out to us with any questions you may have.